A note from my grandma about her: Alta passed away at the age of 101 and grew up in western Kansas. During my grandma's last visit with her, she was reminiscing about the Christmas celebrations of her youth. All of the family went to her paternal grandparent's farm and nice home for the occasion. Everyone could count on there being four cakes on the table for dessert. Combine: sweetened condensed milk, salt, and key lime juice. Stir until thick. Blend in pineapple and food coloring. Pour into baked pie shell and chill for 2 to 3 hours. Whip 3/4 cup whipping cream until stiff. Fold in powdered sugar and vanilla. 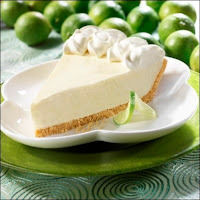 Spread over top of pie and garnish with grated lime peel. This recipe doesn't look real. firstly it says in the ingredients section 4 egg yolks cold... but under method no mentioning of what to do with it.... and under instructions it says use pineapple...!?! where did the pineapple come from?? ?